It was in 2015 when I decided to give this blog the clean and simple look that it has today. Gone are the bright pink touch and frills that it used to have. It was my little way of telling my readers that the blogger they've known for years have experienced changes in her life. And that I wanted them to also feel those changes here in my virtual home. I realized that the more time I invest on simpler thoughts and joys, the happier I get. Isn't that delightful enough to always choose to walk on that path? Sure, I have grand dreams for my family, especially for my only girl Sophia but I still find life easier to live each day whenever I choose to live it simply - from keeping my circle of friends small to not going to all events I'm invited to. It's not that I'm applying Marie Kondo's organizing techniques into our lives (it can never be suited for our set-up anyway) but I truly enjoy the things that truly matter now because of this change. In fact, it reached my choice of clothes and shoes and accessories. You can check this Pinterest board to see what I mean. I am slowly completing my wardrobe of the basics. That's why I'm always on the lookout for local stores that sell whatever is in my *uniform*. And I'm just so glad I found one on Instagram - Kees! Mikee Venezuela, the mompreneur who owns it, shared that Kees was established on her late mother's birthday, February of 2015 (the same year I did my blog rebrand, btw). After many years of celebrating it with a happy face but a heavy heart, she finally found another reason to celebrate it with great joy and fulfillment. She decided to create Kees for the girls, who wants things simple no matter what occasion. She said, "Kees aims to give you a pair that can go with everything; can be dressed up or dressed down; from a casual day to a fancy night." I truly agree. I love my Kees so much that I bought pairs and bags for my mama and MIL. It's a must-have, you all. It can be for your daily grind at work (change from heels to flops if you are commuting), grocery shopping, eat out with friends, your kids' school activities and yes, perfect for the coming summer! Oh moms with girls, you can do twinning, too since they also have smaller sizes for your little ladies. How exciting, right? 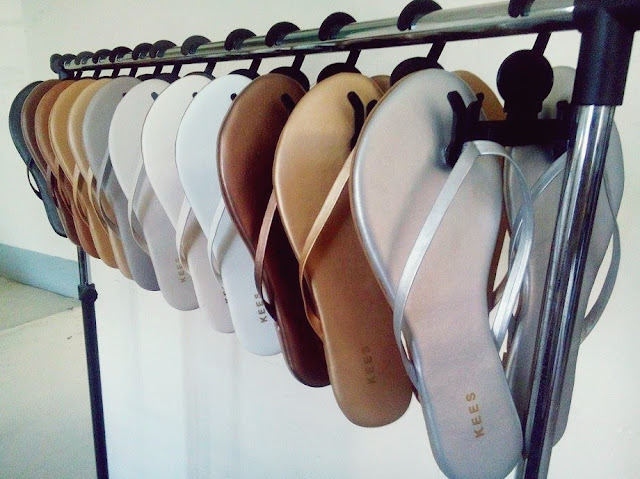 But here's the more exciting part - since Mikee and I want to share our delight for simple style and living with you, we are giving one lucky girl pairs of flip flops for her and her BFF - can be your mom, daughter, sister, friend, colleague, whatever (basta girl siyempre). Like our Facebook pages (HERE and HERE) and follow us on Instagram (@royaldomesticity and @kees.collection). Then post on Facebook a photo of you and your BFF enjoying your most memorable summer together. Write on the caption why it was your best summer with her. Tag Kees and Royal Domesticity so we can see your entry. Don't forget to set that post on public. Lastly, use the hashtags #LiveSimplywithKees and # RDxKees to make your entry valid. Disclosure: I received items from Kees but all thoughts and opinions are my own.